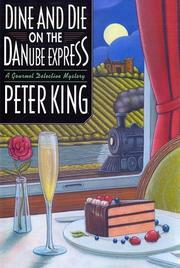 Expecting merely another sybaritic gustatory experience as he boards the Danube Express for its 25th anniversary chug through eastern Europe, the Gourmet Detective (Roux the Day, 2002, etc.) has barely sampled the first night’s seven-course dinner before security chief Karl Kramer needs his help: The most famous passenger, stage star Magda Malescu, is, according to a news flash in the Budapest Times, dead in her compartment. But where has her body gotten to? Why is the compartment permeated with the scent of bitter almonds? And how did the reporter hear about this almost before it happened? There’s no shortage of suspects on board, two of them—Magda’s understudy and a cynical journalista—soon murdered and a third—a wine connoisseur, working security for the wine growers’ association, but also undercover for another unspecified party—nearly so. When Magda reappears, a flummoxed Kramer and G.D. are concerned that all this hullabaloo might be to distract their attention while the baggage car is relieved of a newly discovered Mozart manuscript or grape vines meant to improve the quality of Romanian vintages. The bodies are discreetly removed from the train; Magda’s love life is scrutinized; more heavenly fare is consumed; and charming castles, chalets, cows, and country folk are glimpsed through the windows before the Gourmet Detective disembarks in Bucharest. Forget about the mystery, best described as detection lite, and concentrate on your cholesterol level, which will rise just from reading about the butter, cream, flour, crepes, ducks, goose, raspberry sauce, and apricot liqueur.